It's a common belief, reportedly amongst even regulators, that the airbags in your car will continue to work for at least a few seconds after the rest of your car's electrical systems stop working. That is probably not true. The disturbing report below gets into the details but here's the best fact: Regulators thought airbags in cars — like the GM vehicles recalled due to ignition failures — would work for a full 60 seconds after a car stalled. The reality? It was about 150 milliseconds. Regulators, lawmakers and ordinary drivers are learning what auto engineers already know: These billowing white bags are actually very complex. After a crash, a car's computer determines, in 15 to 20 milliseconds, where it was hit, what position the occupants are in and whether the 150-mile-per-hour speed of the air bag would do more harm than good. Then it deploys — or doesn't. Every automaker programs them differently. "It's very complicated, the logic behind it. 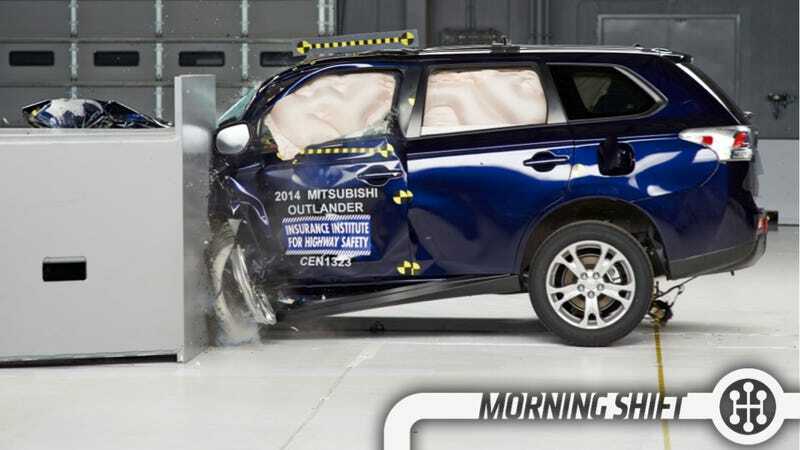 It makes it very, very difficult for an automaker or supplier to explain why it did or didn't go off in a certain situation," said Joe Nolan, senior vice president for vehicle research at the Insurance Institute for Highway Safety, a group funded by the insurance industry that performs crash tests and other research. Regulators are now checking with automakers to see what the deal is with their airbags. You know what part of the Fiat Chrysler brand that Americans love? No, it's not Chrysler, no one buys Chryslers yet. It's freakin' Jeep. Therefore, as Karl Henkel reports, it's possible that more Jeep manufacturing will come to the U.S.
"I'm going to avoid answering that," Marchionne said Tuesday at a Chrysler transmission plant in Tipton, Ind., when asked of possible U.S. greenfield projects relating to Jeep. "(But) It may require the expansion at some of our plants." Let's be honest, they ain't building that Jeep Grand Wagoneer in Europe. Like we've been saying (and many others have been saying, as well), there's a bit of a disconnect between the brands that work extremely well for Fiat Chrysler and the ones that don't… and the ones that don't are the volume car sellers. It's why this Reuters article from the same visit above cracks me up. "The targets are the targets. But even if I miss it by 10 percent, from where I am today, it's like (the) midget and the Jolly Green Giant," Marchionne said at the dedication of a new transmission plant in Tipton, Indiana, on Tuesday. His suggestion was that Fiat Chrysler would prosper, whether or not it falls a bit short of meeting some of his lofty goals. The Green Giant, mentioned with a touch of humor by Marchionne, is the towering animated character with a deep "Ho, Ho, Ho!" long used to advertise a brand of canned and frozen vegetables produced by General Mills. The last graph has nothing to do with the idea that Marchionne doesn't care so much about the actual number as he does about measurable growth, but I like the idea that Bernie Woodall (or an editor) thought they needed to describe the Jolly Green Giant. It is certainly precise, but also unintentionally hilarious for how humorless it is. 4th Gear: GM Will Definitely Build Spark Batteries In The U.S.
As manufacturing this country continues to sort of ping back and forth between the Rust Belt, the Deep South, and California (with a little bit of Midwest thrown in for good measure), we're seeing that batteries for the Spark EV will get produced at GM's Brownstown Township plant near Detroit. Not like anyone is actually buying these EVs, which are essentially compliance cars at the moment (cars built to comply with CA EV standards), but the new packs are apparently 86 pounds lighter. Lightness is good. Volkswagen makes trucks through MAN and commercial vehicles through its own Volkswagen line, but now the successful takeover of the parts of Swedish company Scania it didn't already own means VW can build one larger, unified truck brand. The brands won't go away, at least not yet, but unions are concerned that this will lead to a reduction of the Swedish workforce. On this day in 2007, the European-American carmaker DaimlerChrysler, created in 1998 in a $36 billion merger, announces that it is selling 80.1 percent of the Chrysler group to the U.S. private-equity firm Cerberus Capital Management. Neutral: How Long Will Your Airbag Work? Do you have any idea how your airbag actually works under non-optimal conditions? What about optimal conditions?